This is a time of year when new life is born to maintain a continuance of species. Signs are all around us. Much of it is obvious, as in nesting birds or budding plants. But much of it we cannot see, unless we look closely. Take the eastern oyster, for example. For as long as I’ve lived on Hatteras Island, oysters have been a fascination to me. Whenever I go collecting, it’s apparent that they grow in certain areas more than others. I notice that even in those more prolific spots, that the oyster population has generally been in a steady decline. This is attributed to over-harvesting, water pollution, parasites and lack of substrate material for new oysters to attach and grow. 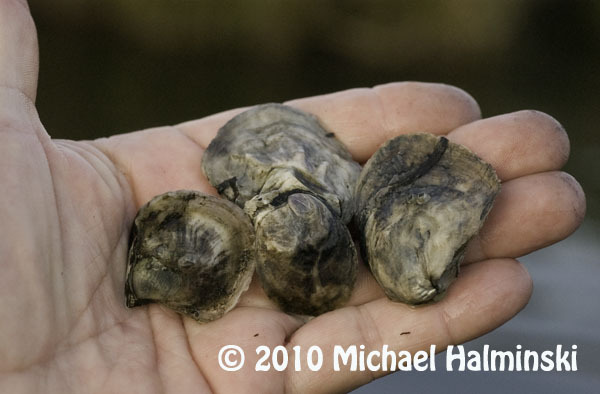 Mature brood stock oysters emit egg and sperm into the water column, which in turn combine to produce eyed larvae, the beginning of becoming a true oyster. A scientific collection permit has allowed me to gather brooders for my own oyster garden spawning. 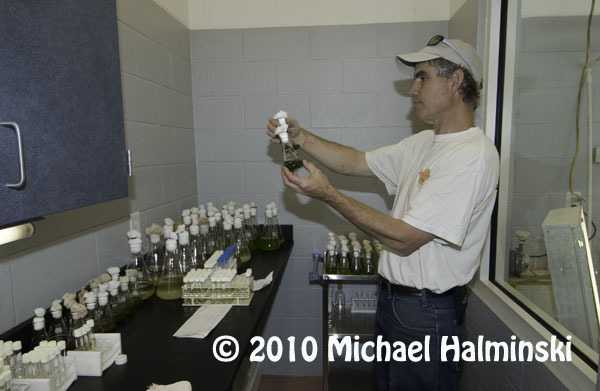 I also donate collected brood stock to the aquaculture program at Carteret Community College and to the University of North Carolina Coastal Studies Institute at Cape Hatteras School. 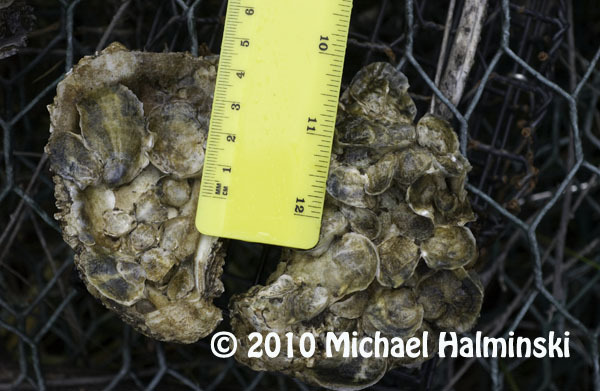 Several years ago I attended an oyster conference in Morehead City, where I saw a number of scientists and people like myself looking for answers. It was here where I met Dr. Kemp. He runs the aquaculture program at Carteret Community College. A number of us got together and founded Shellfish Gardeners of North Carolina. We are interested in growing oysters, not only as a recreational activity, but also as a way to help the environment. We have had workshops to learn more about life cycles, water quality and to educate others. For oyster gardening in eastern Pamlico Sound, Skip Kemp has been my mentor. This has evolved into a network of people compiling and studying data. I collect water quality data for the Citizen’s Monitoring Network out of East Carolina University, and also compile information for the Oyster Spat Monitoring Project based at University of North Carolina in Wilmington. Past data indicates that now is a prime time for local oysters to be spawning, so I have to keep a sharp eye out to see if there are any new oyster spat. 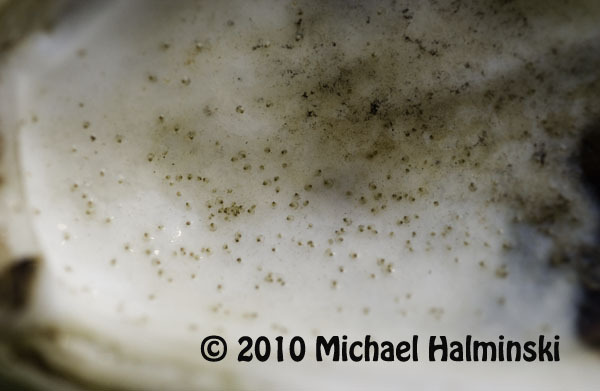 These eyed larvae have attached to an oyster shell and are 1 day old oysters. 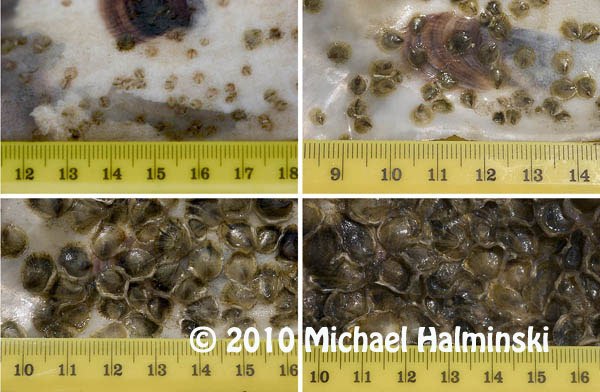 This composite image shows new oyster spat at weekly intervals beginning with 1 week old at the upper left and 4 weeks old on the lower right. The initial growth rates are dramatic. The ruler scale is in centimeters. These are almost 5 months old. Yearlings can come in different sizes, depending on environmental conditions. 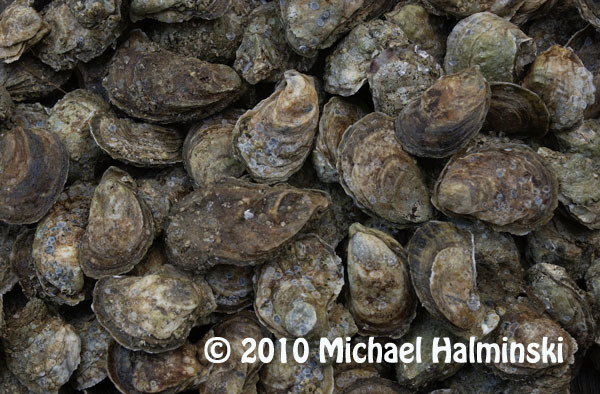 This entry was posted in Outer Banks, oysters, Pamlico Sound on June 22, 2010 by j0jgvm89bj.